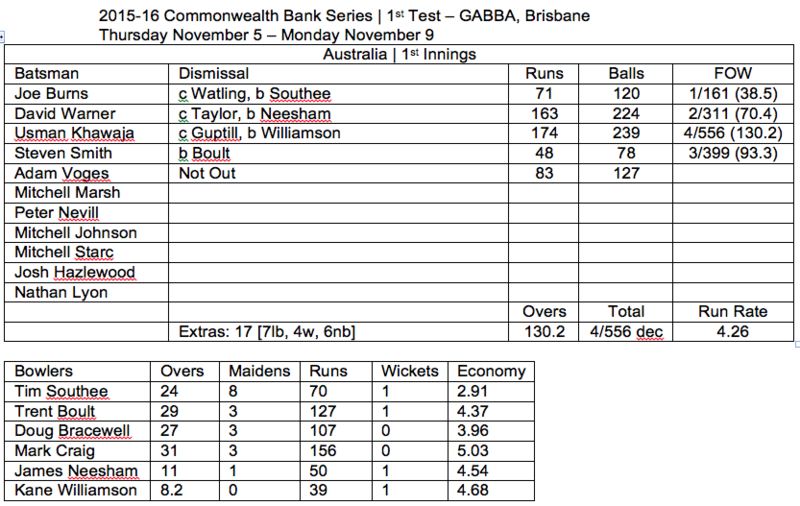 Hello again from the GABBA, where Australia remain in control of this opening Commonwealth Bank Test Match against New Zealand, as they were at the close of play yesterday. Australia holds a 399-run lead over the BlackCaps, after declaring on 4/556 in the middle of the afternoon session, before the bowlers did the damage, and left the Kiwis reeling at 5/157 at the close of play on day 2, after just 45 overs of batting. At the start of play this morning, it was Steven Smith and Usman Khawaja taking guard, picking up where they left off last night. It was a challenging opening few overs for the pair, with the first run being scored off the final ball of the third over of the morning. In the second over of the day, Khawaja survived a DRS challenge from the BlackCaps, who reviewed a LBW decision that wasn’t in their favour… it was a delivery that was pitching outside the off-stump, and the decision stood as not out. Soon after, Steven Smith was clean bowled off a beauty from Trent Boult, and it’s very rare that the captain doesn’t convert a start into (at least) a half-century, but today he departed on 48. Adam Voges was the next man in. He and Khawaja kept scoring at a moderate tempo, slowly lifting the run-rate back up before lunch, in the only session of the four to that point where that failed to score 100 runs. Just 93 runs, for the loss of Steven Smith in the opening session of the day, and Australia went to Lunch at 3/482, but not before Adam Voges, in his maiden test on Australia soil, reached 50. Upon the resumption of play, the batsmen were given the green light from their captain to increase the scoring rate, as a declaration loomed. 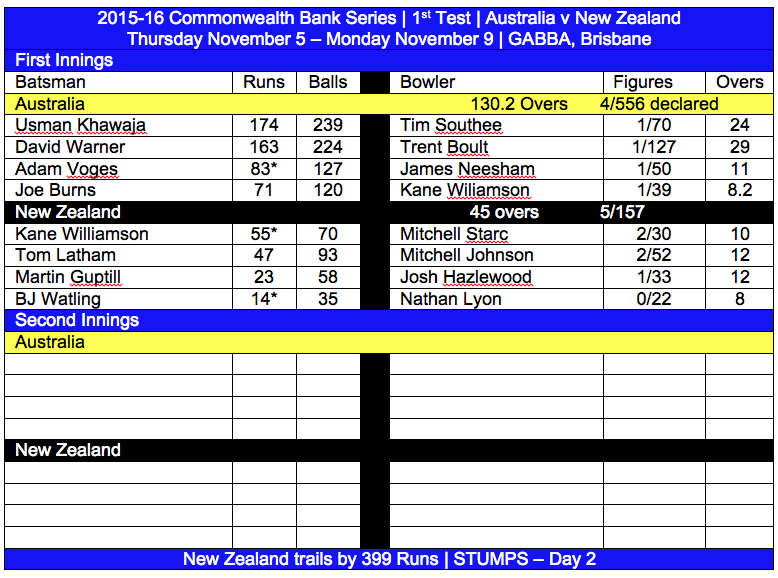 Khawaja passed 150 off just 200 balls, and the Aussies score was over 500 by that point. Both Voges and Khawaja were making it look easy, as they smashed the BlackCaps to every corner of the ground, maintaining a run-rate of greater than 4 an over. The score reached 556, when New Zealand finally split what was looking like another dangerous partnership, as Khawaja attempted a reverse sweep, but didn’t hit it well enough, and Martin Guptill was able to take the catch, and with that came the declaration, as well as a standing ovation for the young man who top scored with 174 valuable runs, in the 1st Australian Innings here at the GABBA. 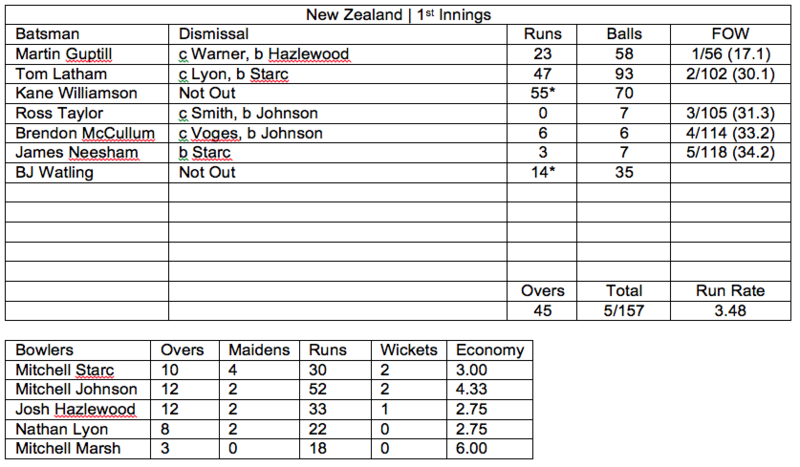 The declaration meant that New Zealand would face nearly an hour at the crease before Tea. A very good declaration from Steven Smith, forcing New Zealand into a stop-start situation, but also with the knowledge that there were clouds looming, and the forecast for the remainder of the match isn’t favourable either, with rain expected to play its part over the weekend. 4/556, which means New Zealand have conceded 5/1059 in their last two bowling performances… that’s sad, unpleasant reading for a New Zealand cricket fan. Martin Guptill and Tom Latham made their way to the centre, and to their credit, they survived a fiery opening hour of bowling from Johnson, Starc and Hazlewood, to make it to tea unscathed. The celebrations were short-lived however, because soon after the tea interval, Josh Hazlewood got his man, as Martin Guptill hit a thick outside-edge to David Warner in the slips, and Bam Bam doesn’t drop them. 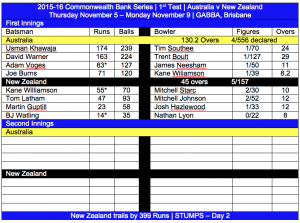 That was the start of a collapse for New Zealand, and also where Australia cemented their position in this contest. Latham and Williamson got New Zealand past 100, before Starc out-smarted Latham, who hit one straight to Nathan Lyon, and it was 2/102. 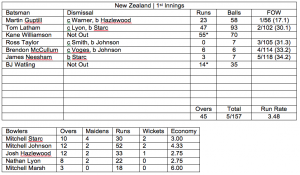 The next three wickets fell very quickly, with Taylor failing to trouble the scorers, McCullum beaten by Mitchell Johnson, and Neesham’s stumps taken out by Starc, and in the space of twenty minutes, the BlackCaps went from one wicket down, to five. BJ Watling joined Kane Williamson, and together, they negotiated the final overs of the day without landing their side in further trouble, but the deficit with three days to play is 399. Solid start from the Australian bowlers, with both Mitchell’s snaring two each, and Josh Hazlewood getting Martin Guptill before he had the chance to settle in. Starc’s delivery to remove Neesham was an absolute corker. Here is the way things stand in this match with three days to play. As you can see, Australia remain in complete control. You simply can not take anything away from Usman Khawaja today though… he’s fought hard for his place in this Australian team, and a maiden century will do him absolutely no harm whatsoever, in maintaining that spot for the summer, at the very least! This is where we find ourselves at the end of the second day. Not going to be easy for New Zealand to get their way back into the match from here, but never say never, especially with a guy like Brendon McCullum in the squad, and at the very least, the draw is still on the table, with rain expected on Sunday. We come back here tomorrow for day 3… catch it live from 10am AEDST. 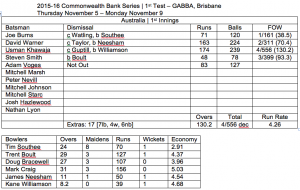 In the meantime, it’s goodbye from the GABBA!